David Foster Wallace: "Forever Overhead" and "Brief Interviews with Hideous Men, B.I. #40"
David Foster Wallace wrote some of the most highly loved American literature of the early twenty-first century, hipster literature, for better or for worse, including his famous novel Infinite Jest and collections such as Girl with Curious Hair and Brief Interviews with Hideous Men. The story "Forever Overhead" resonates ever more mournfully in light of Wallace's suicide four years ago. One of my favorite lines from the piece, among many, occurs in the context of the main character standing on the ladder, in the wind, with the rungs hurting his feet. The word "rungs" sounds so painful, and it is repeated in my chosen line: "The solid man under you is looking through the rungs into the contained space the woman's fall will pass through." With this line, Wallace frames our lives in terms of sight, pain, geometry. The pool is a system, just like the world, and we are all always in a nearly mathematical relationship to it. The word math comes from the Greek, mathema, a word that signifies knowledge and learning, and Wallace connects to the ancient human desire to understand the world, as well as the ancient human tragedy that we have little power to understand the world outside of our binary systems. "Hard or soft? Silence or time? / The lie is that it's one or the other." Raymond Carver: "The Bath"/"A Small, Good Thing"
The main reason I love Raymond Carver is voice. Carver has a knack for telling voice-y, interesting stories, stories that are as sad as they are humerus. A Carver story may not tell you every single detail, but, without a doubt, you aren't left feeling empty. Reading the differences between "The Bath" and "A Small, Good Thing" is such a strange reading experience, especially when read one after another. "The Bath" is a flash of sadness while "A Small, Good Thing" expands upon those emotions and forces the reader to face those problems head on with the family. Only one thing remains consistent: The family is tormented by an evil baker, who is playing possibly the worst thought-out prank in all of literature. In your blog entries, discuss your own experiences in reading these two stories. What about them is similar? Or different? What kinds of changes did you notice in the writing? And don't forget to include what you liked (or disliked) about them. 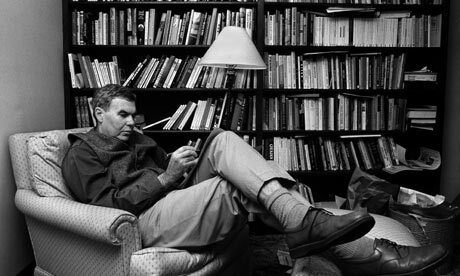 Because let's face it, Raymond Carver is awesome. "Good God," cries the Mother. Everything inside her suddenly begins to cower and shrink, a thinning of bones. Perhaps this is a soldier's readiness, but it has the whiff of death and defeat. It feels like a heart attack, a failure of will and courage, a power failure: a failure of everything. Her face, when she glimpses it in a mirror, is cold and bloated with shock, her eyes scarlet and shrunk. She has already started to wear sunglasses indoors, like a celebrity widow. From where will her own strength come? From some philosophy? From some frigid little philosophy? She is neither stalwart nor realistic and has trouble with basic concepts, such as the one that says events move in one direction only and do not jump up, turn around, and take themselves back. I want to dwell for a moment on Moore's characterization of the Mother through dialogue, appearance, metaphor, and thoughts. At the center of this story, the Mother is, by profession, a writer. In this passage, we see her sense of her own failure as a writer and human being, which Moore both shows (Mother's appearance) and tells ("a failure of will and courage"). Her thoughts dominate this passage, and the story. I like how, through this character, Moore is giving us A Portrait of the Writer as a Middle Aged Woman (to knock off Joyce). The person we get to see is not one who flinches away from flaws. Saunders is a generous, political, voice-driven, civic satirist whose writing has gotten into my head and my heart. 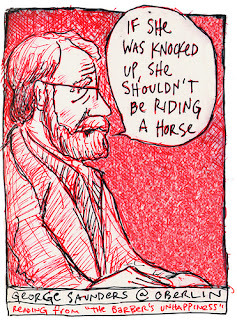 This cartoon is from a reading he gave at Oberlin in 2007. 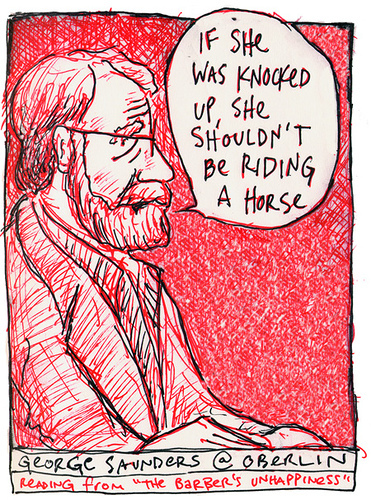 Want to hear George Saunders talking to Susquehanna and Widener students in February, 2011? Listen here on YouTube. You can also see him talking on Letterman and Charlie Rose. 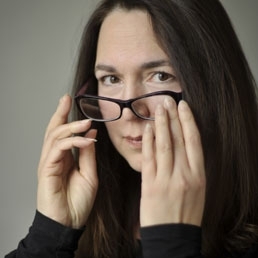 Hold on to your party hats: Saunders will give a reading at Susquehanna in the spring of 2014. FYI: He teaches in the MFA program at Syracuse University. Flannery O'Connor: "A Good Man Is Hard to Find"/"Good Country People"
You may not realize it by looking at her, but Flannery O'Connor is kind of a badass. I say this in the sense that her stories read like Tarantino films: unforgiving, gory and tense. Take the first story in this collection "A Good Man Is Hard to Find." In it, O'Connor meticulously crafts The Misfit, a man full of evil and violence, but examines who really is the "good person" at the end of the day. She asks the age-old question: Is true human character only revealed at gun point? Just ask the supposed innocent grandmother after The Misfit shoots her dead. What I love about Flannery O'Connor is her ability to create true unlikeable characters and make them the focus of her stories. We almost root for the villains to successfully perform the villain-things they must do, and for that each O'Connor story is a page-turner. In the Burroway reading for last class, she wrote this of character: "Conflict is at the core of character as it is of plot. If plot begins with trouble, then character begins with a person in trouble; and trouble most dramatically occurs because we all have traits, tendencies, and desires that are at war, not simply with the world and other people, but with other traits, tendencies and desires of our own." Reflect on this idea of "trouble" in a story and you blog on Flannery O'Connor. What sense of doom to you get from these stories? How does it make them better? Stacey Richter: "Beauty Treatment" & "The Cavemen in the Hedges"
Stacey Richter, and these two stories, are both awesome. In fact, her entire collection of short stories -- "My Date With Satan" -- is a book I urge all of you to pick up if you enjoyed these selections. Richter writes with a voice that is just plain fascinating. She has the ability to turn abstract and bizarre scenarios into real-life moments that a reader can clearly picture. My favorite of these two "The Cavemen in the Hedges" is one of the most memorable stories I've read, a unique and fascinating portrayal of the downfall of a relationship during times when "cavemen" rome the world. There is never a dull moment in a Richter story. In the comments of this post, talk about what you loved, or maybe didn't love, in Richter's stories. One thing I think we will all agree on is that these stories are weird. Whether or not they are too weird for your liking is to be seen, but I'd be shocked if they were. But, that's just me.